Often, I will write about going deeper into the text and I will refer to the bottom and the surface of something. That something is the iceberg. The Iceberg Concept is something Mrs. Patten taught me last year in 9th grade English. 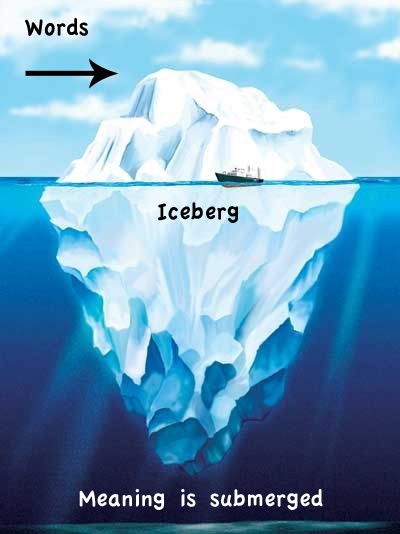 The Iceberg Concept is an illustrated way to show you two things. The first is the surface of the text, or the tip of the iceberg/the surface of water. The second is going under the water, to the bottom of the iceberg, hence going deeper. Above the surface of water is the text, and under the surface, submerged, is the true meaning and analysis. I found this to be very helpful and think it is a fantastic concept to think about and use while writing. What a neat blog you got here, buddy. I have been reading your blog, and I find this concept fascinating: to dive deeper into more analytical topics. I am a fellow reader, and I agree with everything you say here. Keep up the good work and may future successes be with you.